Clarets keeper Nick Pope was the big winner as Burnley celebrated an historic campaign at their annual Player of the Year Awards at Turf Moor on Monday night. Pope claimed both the Player of the Year and Players’ Player of the Year gongs, as around 900 supporters gathered to acclaim boss Sean Dyche, his backroom staff and players, after a season in which they have delivered European football for the first time in 51 years. 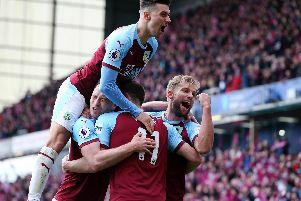 The Clarets were guaranteed a seventh place finish – their best performance in the top flight since they finished sixth in the old First Division in 1974 – when Everton were held by Southampton on Saturday night. Pope hadn’t made a Premier League appearance until September 10th, when he replaced club captain Tom Heaton at home to Crystal Palace, and has gone on to play 34 times in the top flight, claiming 12 clean sheets in total. He was also called up to the senior England squad for the first time last month for the friendly games against Holland and Italy, and is in contention for Gareth Southgate’s World Cup panel, which will be named early next week after the final round of Premier League fixtures on Sunday. Belgium midfielder Steven Defour won the Goal of the Season award for his free-kick at Old Trafford on Boxing Day in the 2-2 draw against Manchester United. Defour has been out since the end of January after knee surgery, and said: “It’s difficult to see the team play because you want to be on the pitch. “But I’m doing very well. Defour has European experience from his time in Belgium, and with Porto in Portugal, playing in the Champions League, Europa League and it’s predecessor the UEFA Cup: “I think it’s an amazing achievement for the whole club. “I think we have to continue like we have done. “We have always improved and I hope we can improve next year. The top goalscorer award, sponsored by Burnley FC in the Community, was presented by Chief Executive Neil Hart to Chris Wood, who is currently tied with Ashley Barnes on 10 goals each in all competitions. Young Player of the Year was Dwight McNeil, who received his award from Liam Kilbride of award sponsor Bliss Charity. Centurion awards were made to left back Stephen Ward and striker Ashley Barnes, who both made their 100th appearances for the club during the current campaign. Midfielder Ashley Westwood accepted the award on behalf of Barnes, who was absent due to the shoulder injury he sustained in the defeat at Arsenal on Sunday, from sponsor Gary O’Neill of G O’Neill Plumbing Services and son Josh.